In 2015, more than 125,000 organs, mostly kidneys, were transplanted from one human being to another in the United States. Sometimes the donor was a living volunteer. Usually, though, he or she was the victim of a car accident, a stroke, a heart attack, or a similar sudden event that had terminated the life of an otherwise healthy individual. But a lack of suitable donors, particularly as cars get safer and first aid becomes more effective, means the supply of organs is limited. Many people therefore die waiting for a transplant. That has led researchers to study the question of how to build organs from scratch. One promising approach is to print them. Lots of things are made these days using three-dimensional printing, and there seems to be no reason why body parts should not be among them. 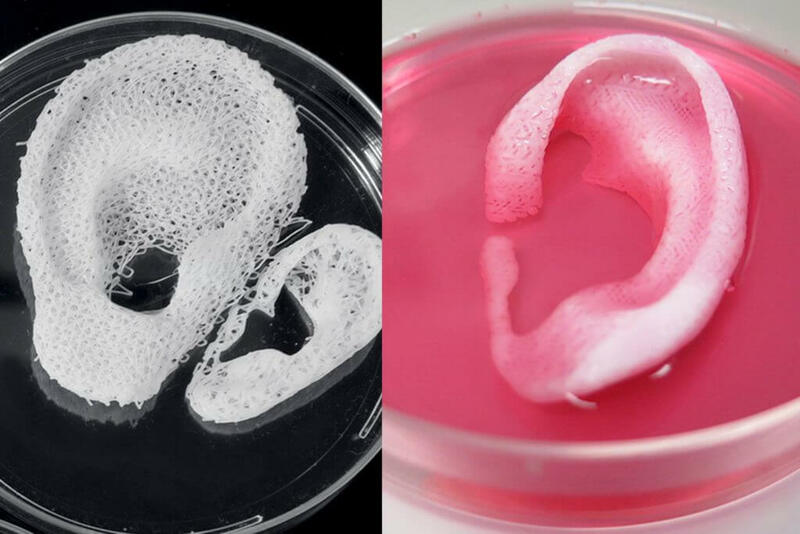 As yet, such “bioprinting” remains largely experimental. But bioprinted tissue is already being sold for drug testing, and the first transplantable tissues are expected to be ready for use in a few years’ time. Bioprinting originated in the early 2000s, when it was discovered that living cells could be sprayed through the nozzles of inkjet printers without being damaged. Today, using multiple printheads to squirt out different cell types, along with polymers that help the structure keep its shape, it is possible to deposit layer upon layer of cells that will bind together and grow into living, functional tissue. Researchers are tinkering with kidney and liver tissues, skin, bones, and cartilage, as well as the networks of blood vessels needed to keep body parts alive. They have implanted printed ears, and also muscles, into animals and watched these integrate properly with their hosts. Last year, a group at Northwestern University even printed working bioprosthetic ovaries for mice. The recipients were able to conceive and give birth with the aid of these artificial organs. No one is yet talking of printing gonads for people. But blood vessels are a different matter. Sichuan Revotek, a biotechnology company based in Chengdu, China, has successfully implanted a printed section of artery into a monkey. This is the first step in trials of a technique intended for use in humans. Similarly, Organovo, a firm in San ­Diego, ­California, ­announced that it had transplanted printed human-liver tissue into mice and that this tissue had survived and worked. Within three to five years, Organovo hopes to develop this procedure into a treatment for chronic liver failure and for inborn errors of metabolism in young children. The market for such treatments in America alone, the firm estimates, is worth more than $3 billion a year.